It’s that time of year again… the time where cold and flus are hitting hard. This year seems to be particularly bad for people, at least from the amount of complaining I’ve noticed on Facebook. 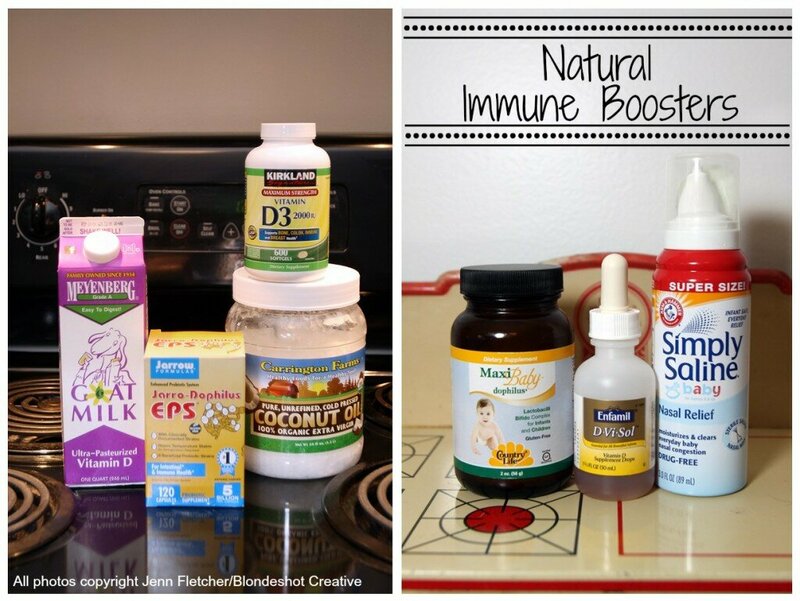 Having a healthy immune system doesn’t mean never getting sick. But when you do get sick, it means your body is able to heal itself, and in a shorter amount of time. While there are a ton of different options for naturally boosting the immune system, both for preventative care and once you’re sick, keep in mind that not every option works for every person. Please note that I am not giving medical advice, but am sharing some tips on things that we do in our own family, and were recommended to us from like-minded medical professionals. If these topics are of interest to you, I always recommend doing some further research on your own. Let’s first touch on the things you already (should) know. Get enough sleep, eat healthy (especially minimal amounts of processed foods, sugar, GMOs, etc. ), drink lots of water, get plenty of exercise, don’t smoke, keep your stress levels low, and for babies and young children, breastfeed if you can! Get regular Chiropractic care- Basically, the nervous system and immune system, along with lots of different organs, are all hard wired together. Chiropractic adjustments can boost responses needed to stay healthy and fight off infections, inflammations, and all sorts of other things. Take probiotics- Because so many of our immune cells are located in our digestive tract, maintaining a healthy gut is way more important than just for digestive issues. Get plenty of vitamin D (via sunlight and supplements)- Studies have proven that vitamin D is essential for immune health and most people don’t get enough in their diets and by sunlight. We take this on a daily basis and take extra when we are sick. Get fresh air (even when it’s cold out! )- It’s easy to stay inside during the cold winters months, but bundling up and heading outside for some fresh air can do wonders for both mind and body. In Sweden, parents and daycares routinely leave their babies outside to nap in sub-zero temperatures. They feel that children are less likely to catch colds outdoors, whether it be summer or winter, than being crowded into rooms full of other children and sick germs. Consume coconut oil in your diet- Coconut oil has antibacterial, anti-viral, and antifungal properties, and can be ingested or used topically for many ailments. (There are also certain herbs and spices like garlic, ginger, and cinnamon that can be beneficial to the immune system to consume on a regular basis). Drink goat’s milk instead of cow’s milk- The makeup of goat’s milk is completely different than cow’s milk and is said to be the closest to breast milk in makeup (but tastes the most similar to cow’s milk incase you were wondering). Many people with dairy issues can actually tolerate goat’s milk since the lactose and protein are different. It also contains lots of minerals, including antibacterial enzymes, and bonus, it’s not common practice for goats to receive growth hormones and antibiotics like cows do! Practice good oral hygiene- Your mouth is a harbor for some pretty gnarly bacteria. Keeping a clean mouth so that the bacteria doesn’t penetrate deeper into your system is just always a good idea. Get a little dirty (and have pets)- The body needs some germs to make it grow stronger. This isn’t a one-time thing however; it’s a lifestyle. We don’t over sanitize or clean things, use antibacterial soap, or create a sterile living environment. We eat food that has fallen on our own floors, we live with and kiss our household pets, and visit farms on a regular basis. Did you know that children who are raised on farms develop better immune systems? Wear Amber- While I can’t prove this one works, it certainly doesn’t hurt! I have had an amber teething necklace on my child since she was tiny, and have always felt like it has helped with her teething pain. But aside from that, the oils in amber, when heated by body heat and absorbed through the skin, are also supposed to help boost the immune system. I have recently began wearing amber myself if I feel like I might be getting sick. Elderberry Syrup- I’ve saved my favorite for last, as this is by far my #1 right now. It has so many great qualities and components to the berries, is delicious, and can be used as both a preventative and healing agent. 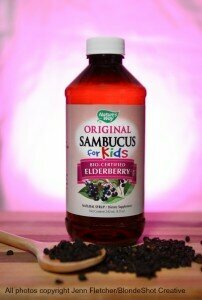 You can also purchase this pre-made (They have Sambucus at Whole Foods, Harry’s and Goodness Grocery) or make your own. Components of the juice destroy the ability for cold and flu viruses to infect a cell, and in addition to preventing, can also shorten the duration of sickness and reduce the severity of symptoms. Dealing with a sickness anyways? Here are a few tips for helping your body get better faster. Continue to follow all of the preventative measures listed above. Reduce (or eliminate) dairy, and eat extra leafy greens, berries and citrus fruits. Be sure to wash your hands well and often (I also like to do extra laundry when someone is sick in the house to reduce the amount of sick germs that loom on the bed sheets and linens), take an Epsom salt bath, gargle with warm salt water (for throat issues), use essential oils (peppermint, Thieves, lavender, etc. ), and up the doses of vitamin D and elderberry. If you’re having sinus issues, you can also use a humidifier or vaporizer, and for children, use saline in the nose (even if their nose is runny. Since young children can’t blow their nose, the saline will help flush the bacteria in the nose instead of them sniffing it further up into their sinuses.). It’s also a good idea if you are nursing and the child has a cold with sinus problems, to plug the nose while nursing a few times each session. This helps with the pressure and fluid build up to prevent the cold from turning into an ear infection. Substituting coconut water for products like Gatorade or Pedialyte to prevent dehydration is a great natural remedy. In our household, we also tend to not treat any symptoms or fevers unless severe. Treating them may make you feel better temporarily, but can often cause the illness to stick around longer. Treating the symptoms and not the cause does little for the long run, and your body often needs to go through the process of dealing with the sickness (and therefor the symptoms) in order to combat it itself. Jenn Fletcher is a mother, wife, and photographer, and at this point in her life, she’s had too many good experiences with natural remedies to discredit them. You can find out more about her here.